Johannesburg (Roodepoort) Tel: +27 11 764 2946; Ballito Tel: +27 32 946 2027; Durban (Pinetown) Tel: +27 31 701 6725. The firm Pupuma Mathalia Engelbrecht was established in 1991. 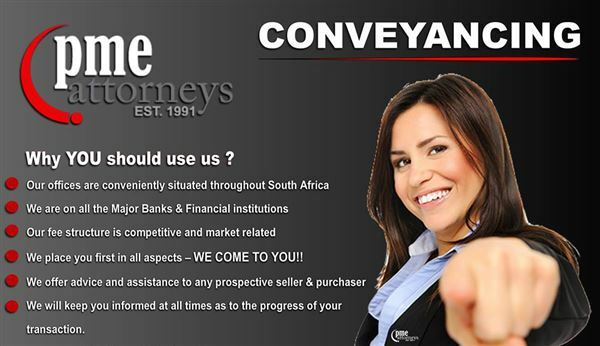 We are one of a selection of firms in South African that specialize exclusively in Conveyancing. We have a stable Gauteng and Kwazulu-Natal client base consisting of various bond originators, estate agencies/developers and financial institutions. 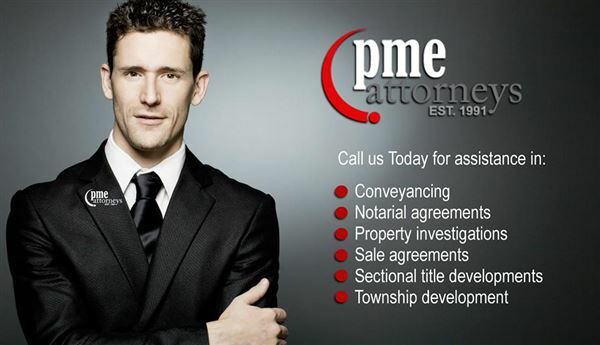 PME Attorneys main sphere of work comprises property transfers, bond registrations, bond cancellations, servitudes, advice on property development, i.e. re-zonings, sub-divisions and the opening and registration of Sectional Title Registers, establishment of townships, etc. Our firm has a long and successful relationship with various financial institutions as mentioned above. All transactions that we attend to are finalised in the shortest possible turn around time. This standard is obtained due to the fact that we go out to the client to sign documents, we personally deliver guarantees and collect Title Deeds, which enable us to drastically reduce turn around times on registration of transfers and bond. We have a contingent of highly qualified and experienced personnel who are grouped in departments dealing with transfers, bonds and bond cancellations. We make use of messengers, docex or courier services to deliver or collect documents from financial institutions, agents and attorneys. We have the best computer hardware and software programs such as Legal Perfect, enabling us to receive instructions and to prepare these accurately, efficiently and speedily. We have various internet addresses and are also linked to Aktex enabling us to do deed searches in-house and to obtain Title Deeds at our offices. We have three conveyancers whom attend to the Johannesburg and Pretoria deeds office on a daily basis. Our documents are also lodged in the Pietermaritzburg Deeds Office on a daily basis. We specialise in the field of conveyancing, Mineral law and other related matters. We are capable in rendering a full compliment of services to yourselves and our clients with the highest standard of professionalism, time efficiency and cost effectiveness. We reiterate the fact that we are a selected group of Attorneys and Conveyancers who have the necessary knowledge, experience and qualifications to offer only the highest degree of professional service.